Preheat oven to 400". Combine sweet potatoes and green beans with 2 tablespoons of the olive oil. Arrange on a lightly greased baking sheet and roast. In a medium bowl, toss red onion and bell pepper with 2 more tablespoons of the olive oil. When sweet potatoes and beans have roasted for about 10 minutes, remove baking sheet from oven and add onion and pepper mixture, stirring well to mix and prevent burning. Return to oven. While potato, bean and onion combination is roasting, combine mushrooms and zucchini with another 2 tablespoons of olive oil. When potato, bean and onion combination has roasted together for 5 to 10 minutes, add mushroom and zucchini mixture, stirring well to mix and to prevent burning. Roast all together for about 5 minutes until vegetables are nicely browned and tender. Remove from oven. In a medium serving bowl, toss all roasted vegetables with balsamic vinegar mixed with mustard. Pepper to taste. Sprinkle with fresh basil or parsley. Serve at room temperature. (c)1999 Diana Schwarzbein, Nancy DeVille and Evelyn Jacob Jaffe. All rights reserved. 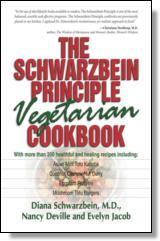 Reprinted with permission from The Schwarzbein Principle Vegetarian Cookbook by Diana Schwarzbein, Nancy DeVille and Evelyn Jacob. No part of this publication may be reproduced, stored in a retrieval system or transmitted in any form or by any means, without the written permission of the publisher. Publisher: Health Communications, Inc., 3201 SW 15th Street, Deerfield Beach, FL 33442.